What should I consider when evaluating a request to delete materials from a digital preservation environment? I'm trying to write a small program to identify floppy disk formats automatically in order to enable efficient bulk disk imaging. Details of the approach are outlined here. As part of this I need the program to create every possible variant of disk image in order to test each to find out which type of disk it actually was. For this to work I need to know what possible types of disk there might have been. For example, double sided disks, single sided disks, disks that should be read at 300rpm, disks with 40 tracks, disks with 80 tracks, etc. I don't have a lot of knowledge of disk formats however and so am hoping that others will know what settings I should include in the program. For example, are there other RPM that disks were read at aside from 300 and 360? Also, Are there any standard sector counts? (etc). I have started a spreadsheet to capture options here. I do not want to circumvent the use of this site so can you please give any answers you can on this site and in the spreadsheet also if possible. I will ensure that any that are only posted on this site are consolidated in the spreadsheet and included in the program. Wikipedia already has what appears to be a comprehensive list of both physical and logical floppy disk formats. It's worth noting that while 300 and 360 rpm will get you quite far, there are exceptions. For example, Amiga 1760 KB floppies were 150 rpm, the Atari 8-bit 5¼" used 288 rpm, and old Apple systems were notorious for using different forms of variable rotation speed (for example Apple II 3½", Apple Lisa, and Macintosh double-density disks). If you have more data, or know of floppy disk formats not listed in Wikipedia's table, I would encourage you to amend the table on Wikipedia, with relevant citations. This was a great start thanks. I'm adding some more settings to the question and spreadsheet which the wikipedia page doesn't answer though. 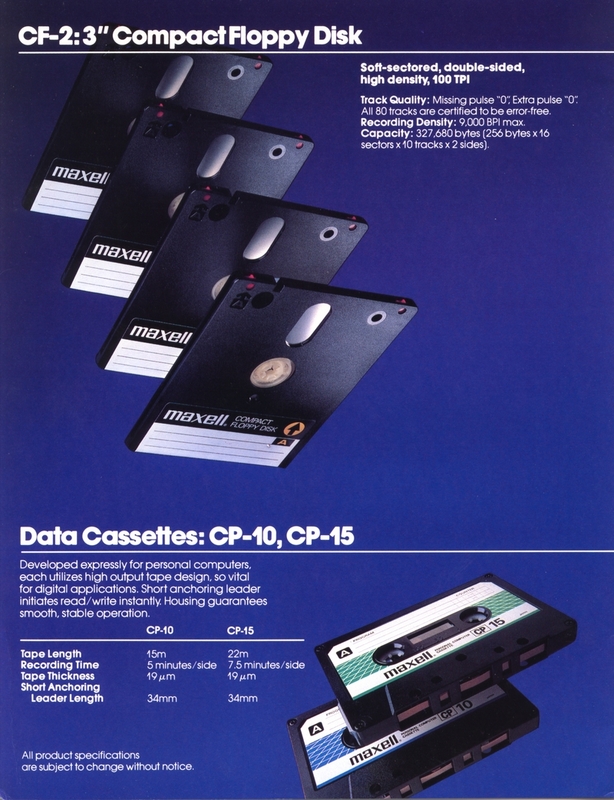 Also Jason Scott linked to this http://digitize.textfiles.com/items/1983-maxell-catalog/.m/1983-maxell-catalog-10.jpg which describes another format not mentioned on the wikipedia page.